The G2 BOCHK Wealth Management Jockey Club Sprint (1200m) could not have gone much better for John Moore as the trainer landed a fifth win in the race, but it was not with the horse that most punters were anticipating as Not Listenin'tome landed the spoils. The top handler sent out three runners in the Jockey Club Sprint, headlined by comeback galloper Able Friend at his first run since last year's LONGINES Hong Kong International Races. However, it was Not Listenin'tome who caused a 42/1 shock under visiting Australian rider Hugh Bowman as he held off Francis Lui-trained favourite Lucky Bubbles (Brett Prebble) by a half-length, stamping himself as the longest-priced winner of the traditional LONGINES Hong Kong Sprint trial in the process. 2014 Hong Kong Sprint winner Aerovelocity was a pleasing third for Zac Purton, a length and a quarter away, with a ring-rusty Able Friend (Tommy Berry) not disgraced in fourth. For Not Listenin'tome, it was a return to form after the son of Dylan Thomas had disappointed at his first two runs this season – a fifth over the straight 1000m first-up in the G3 National Day Cup Handicap behind Amazing Kids, before an eighth in the G2 Premier Bowl (1200m) behind the horse he conquered today, Lucky Bubbles. "Everything fell into place today," said Moore, who had previously won the Group 2 with Able Prince (2006), Happy Zero (2009), One World (2010) and Charles The Great (2013). "We thought the 1000m race, he'd be a force to be reckoned with, but he was given a torrid time and suffered interference. And then obviously we just had to forgive his next run over the 1200m." "Today, he'd come into the race in fine form but he was the forgotten horse. We know when he's at his best he can do something like he did today, and today's been one of those days where there's been a lot of roughies get up. So he just continued the trend!" "But it's great, Hugh rode him a great race, rode him to instructions. He got across, got a little bit of cover there and he kicked. We're going into the race on the 11th with hopes of getting a good draw and a similar sort of run. Today, he was 100 percent and he managed to beat the best of what we've got up here. If we can keep him in this fine form, we look forward to being competitive against the internationals." Bowman partnered Not Listenin'tome three times last season, including to a third behind Peniaphobia and Gold-Fun in last year's Hong Kong Sprint, and he said that a critical gear change helped the noted 1000m specialist see out the 1200m stronger. "I got a lovely run, he settled the best he's ever settled for me," the rider said. "All the times I've ridden him have been over 1200m and in that time, all his best form has been over 1000m. Twelve months ago, after the Hong Kong Sprint, I thought that the 1200m was too far for him, or at least for him to produce his best, but obviously after what he produced this afternoon, it makes me very excited going into the international meeting." "I was a bit worried today about the 1200m again, especially with the wide draw, but I think the ear muffs were an excellent addition to his gear and he was a much more settled individual this afternoon with that gear change. Because he was more settled, he was able to see the 1200m out really strongly and it's great to see him winning at this level over this distance, because it opens up a lot more opportunities for him." However, Bowman feels that the six-year-old will have to produce a new personal best if he is to take out the HK$18.5 million Hong Kong Sprint on Sunday, 11 December. "I feel he will have to run a little bit better than he did today to win in three weeks, because I feel it will be a stronger race," he said. "But that being said, if I can have the same run as I did last year, it will be very welcome because I think I have the better horse." 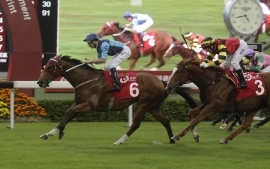 Hong Kong's highest-rated horse of all time, Able Friend, made his long-awaited return to the racetrack after 11 months on the sidelines with a tendon injury, and Moore was visibly happy with his two-and-a-quarter length fourth. "He went super," Moore said. "Tommy said he bottomed out at the 150m but he was really thrilled about the run. He was going to win at the 200m, but by the time he got to the 150m he'd already had enough. Considering the amount of time he's had off, though, you have to accept that and I'm sure he'll be a much fitter horse come international day." Berry, who partnered Able Friend for the first time in nearly three years at the Australian rider's first Hong Kong raceday since May, was full of optimism about the giant chestnut's run and believes he will be a force to be reckoned with in three weeks. "It was a really good run and importantly he felt really good to me in his action," he said. "I thought I was the winner but he just blew out the last furlong. He's right on track for wherever he goes next." Moore said a decision was still pending on whether he would keep Able Friend at 1200m for the Hong Kong Sprint or step him up to his pet distance of 1600m for the LONGINES Hong Kong Mile. "I have to go back to the owner to decide whether we're going to run him at 1200m or 1600m. Probably the mile is more preferable, but he's been off the scene for a while and take nothing away from his run in that race. I'll go back and speak to Dr Li and we'll make a decision tomorrow morning." The most expensive yearling sold in Australia in 2012 by Coolmore shuttler Dylan Thomas (IRE), Not Listenin'tome was a $270,000 Inglis Easter purchase for George Moore Bloodstock from the Arrowfield Stud draft and has been very consistent with eight wins from 27 starts. Not Listenin'tome is the best of two winners from stakes-winning Encosta de Lago mare Flame of Sydney, who was a very speedy juvenile from the family of Group winners Only Words, What Can I Say and Darci Be Good.